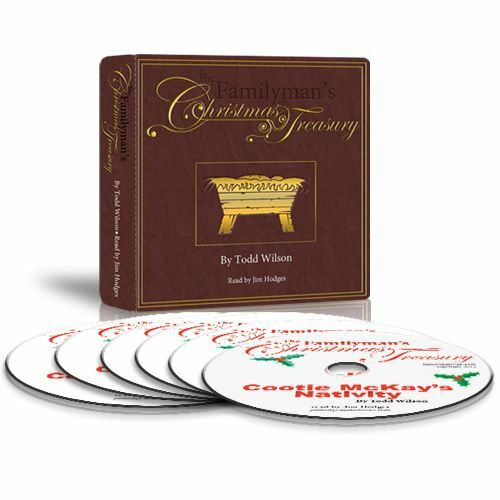 Our whole family has enjoyed listening to these awesome Digital Downloads of the Familyman's Christmas Treasury - Audio Collection from The Familyman. We received the complete collection of Christmas stories as a digital download, plus one story on disc. Each of these stories are easy to listen to and engaging. Even the adults and teenagers in the family enjoy listening to them. Each story illustrates the true meaning of Christmas in a fresh and lively way. The books are written by Todd Wilson and read by Jim Hodges. There are eight titles that we received: Captain Chaos, Cootie McKay's Nativity, Gladys Remembers Christmas, Harold Grubbs, The Bishop's Dream, It's Called Christmas, The Secret of Snow Village, and The Stranger. We really enjoyed listening to these. And even though it's a bit earlier than usual for Christmas stories, these ones really are timeless and teach wonderful truths. They even spark several good discussions. Cootie McKay's Nativity: After a random accident destroyed their annual nativity decorations, the town was worried about their nativity scene being rebuilt. A not-so-trustworthy volunteer agreed to rebuild it, but the town isn't sure if it will even get done. He certainly surprises the town with a beautiful nativity. Gladys Remembers Christmas: Gladys' father is ill and asked for a specific box to be brought to him from his house. While looking for this box, she is magically transported to her childhood full of special memories and most importantly her mother. Through this magical event, she relives her childhood and discovers the true meaning of Christmas. Leaving the house with the box, she realizes that her father has requested the nativity set that had been long forgotten by Gladys when her mother passed away. It's Called Christmas: This story serves as a glimpse into the future. A boy writes a letter to us in the past demonstrating the importance of calling Christmas, Christmas. He experiences in the future what the world is like with all references to Christmas, Christ's birth, the nativity, etc. removed. It resembles an odd and impersonal world. We all listened with anticipation how it would end. The Stranger: A stranger visits the town. One family lets him into their home on Christmas eve. They discover a wealth of blessings through this one stranger, who makes their family a brand new nativity scene. He was a homeless man and they offered him a warm blanket and home for Christmas. All of the stories are very enjoyable. We especially liked the It's Called Christmas story. It was definitely an eye opening glimpse into the future with an almost eerie resemblance to some patterns that are emerging in our world today. What I really appreciate about all of these stories is the focus on the true meaning of Christmas told in a fresh, new way. Even older children are interested in listening. We can't wait to revisit these stories at Christmastime and every year! Curious what other reviewers had to say about this product? Check out the Homeschool Review Crew Blog for more!